Daily give-aways up to $20 just for liking us. Huffy Spalding 66355 50 inch Acrylic Portable Basketball System with Exacta-Height lift. Shipping Included in pricing for shipments to the 48 states. Huffy 66355 Portable Basketball Hoop System with a 50 inch acrylic backboard and heavy duty steel frame and board pad. Also comes with a Pro Slam rim, all weather net, and a heavy duty backboard pad. 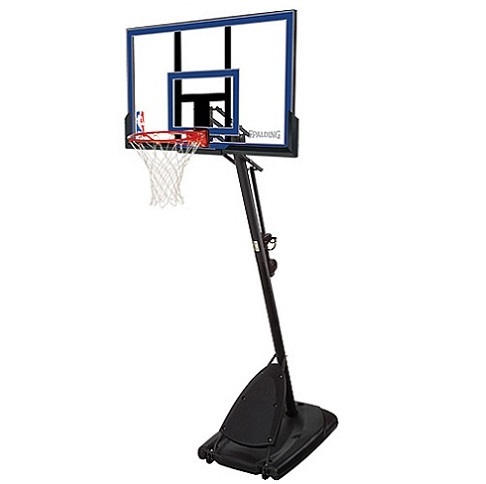 Get ready to play some basketball with this portable Hoop System from Spalding. Anyone can play with this system, including seasoned players and young children. The 66355 also comes with a heavy duty backboard pad and all weather net. You need no cement to start play, just fill the 34 gallon base with sand or water and begin shooting. Practice dunking with the Pro Slam breakaway rim and enjoy hours of recreation with your new system. 50" acrylic backboard with heavy duty 1" x 1" steel frame and board pad. Acrylic backboard thickness: 3.5 mm. 5/8" heavy duty Pro Slam break away rim with white all weather net. Acrylic provides a superior rebound when compared with Polycarbonate or plastic backboards. Backboard mounting provides about 14 inches of clearance between the backboard and the pole. 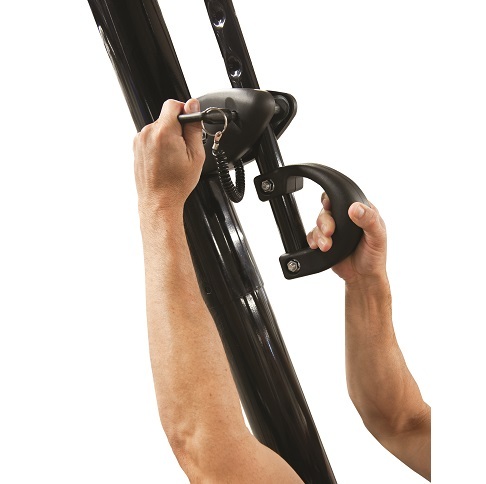 Exacta Height lift provides height adjustment from 7.5 ft. - 10 ft.
Three-piece, 3.5" diameter round pole system for easy assembly. This is the largest diameter round pole available from Spalding. Pole sections are made of steel. Packaging Dimensions: 55.10" x 37.00" x 12.60". This product ships via Fedex and typically leaves the warehouse within 2 business days. The package will typically been in transit 3-5 business days in the continental United States. Silver pole with heavy duty pole pad. 34-gallon capacity base fills with water or sand for stability. 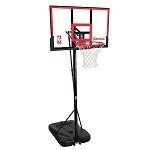 Competitive Edge Products is an authorized retailer for Spalding Portable Basketball Products. If you find the 66355 for cheaper anywhere else online, please let us know. We will try to match or beat their advertised price (price of product + any shipping costs). Order yours today. 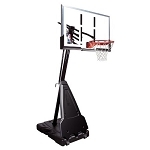 Also consider our Competitive Edge Sports Basketball accessories such as a pole pad and ball return. Q: I was given one of these goals a few years ago unassembled not in box. I want to put it up for my grandson but I have no assembly instructions. Could you send me some? Dimensions: 55" x 37" x 13"